Bodybuilding competitions are usually seen as the best way to judge the best physiques in the world, but increasingly the lifters of today are looking less and less like real people. These days when people think of a good male physique they think of Dwayne “The Rock” Johnson rather than Phil Heath. And the truth is that training for a movie is a much more difficult task. Because you are doing it around your actual job, not only are you having to train throughout the day, you also have to learn your lines, learn the highly intensive choreography for fight or dance scenes, and you then have to completely change your body composition for the next movie. In this article we are going to take a look at 15 of the most impressive physiques in movie history. Just a heads up: these are not in any order, and this is a personal opinion, please feel free to add in any of your favourites in the comments section. When you look back on the first X-Men movie, Hugh Jackman looks distinctly average – in better shape than most men, but nothing special. He has very little muscle tone and doesn’t look particularly strong. Fast forward to “The Wolverine” and he actually looks like a comic book character come to life. He did it the right way too, with deadlifts, and a high protein diet, and a hell of a lot of work. Terry is one of those guys who excels at everything he puts his mind to. American football, painting, acting, bodybuilding, and he even managed to build his own computer. His physique is impressive in all the films he did, but he stands out in the Expendables franchise, which is difficult to do as half the cast is in this list alone. As with Terry Crews, pretty much any of the Rock’s movies could have got him into this list, but his first film is where Hollywood realised that they had a new action hero on their hands, and his physique was incredible in it. Could anyone else have brought this character to life in the same way? It is doubtful. Arnold isn’t the strongest actor in the world (figuratively, he probably is the strongest muscle-wise) but he was perfect for this character. It was a tough decision as to which film Stallone looked best in, and there is definitely a lot of room for debate here. But Rocky III wins it purely for the training montage. Just watch Sylvester and Carl Weathers running on the beach and you’ll agree. 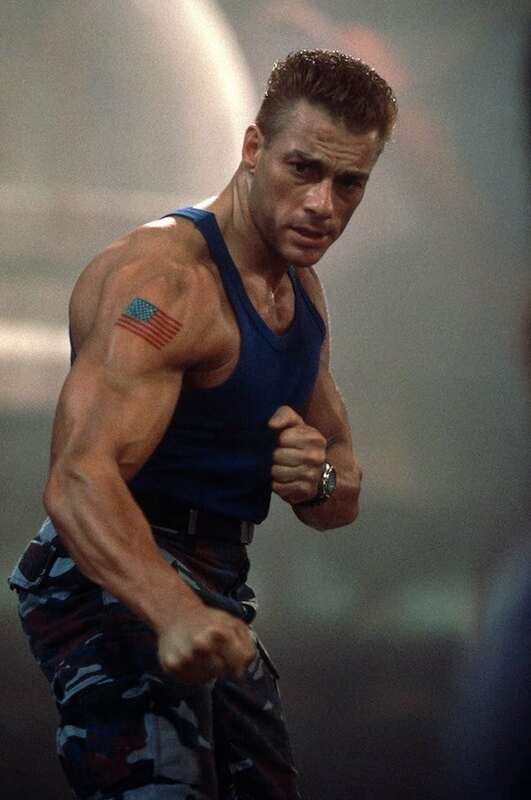 The creator of the perfect bicep pose, Van Damme really looked amazing in this shockingly bad film. At 5 foot 10 and 80kg he’s a regular guy who has created an amazing physique for himself, and Street Fighter proved that. 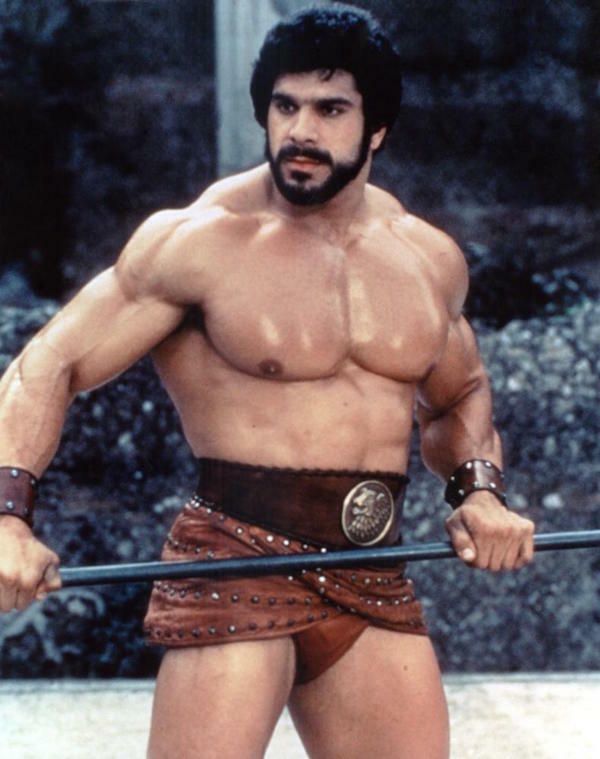 Has anyone looked bigger and more defined in a movie than Lou Ferrigno did in this one? Probably not. Lou looked bigger in this than Arnie did in Conan! Too bad that “The Adventures of Hercules” was such a bad movie! Can we just say “That handshake” and move on? Because there really isn’t anything that we need to add to that statement. Arnie and Carl producing the most manly moment in cinema history. In Rocky IV Sylvester stallone’s Rocky Balboa faced off against Ivan Drago played by Dolph Lundgren. Ivan was supposed to be an almost impossible Goliath-like fighter, and Dolph pulled it off. Standing 7 inches taller than Rocky and with almost no body fat, Ivan Drago looked intimidating even from our safe seats. Another Rocky film! But let’s be honest, the Rocky films were based around amazingly in shape dudes wearing nothing but shorts, so they are going to fill out this list! Mr T had always looked in good shape while filming The A Team. But it was his performance in Rocky III that gets him onto this list. A lot of the physiques on this list look amazingly impressive, but Mr T’s made him look terrifying! Tom’s physique in this may not be his most aesthetically pleasing, but it certainly is his most impressive. His arms were massive, and his chest was huge. He managed to make Batman look small … No mean feat! That beach scene. Enough said! You could really give this one to every single one of the actors who played a Spartan warrior. But Gerard was front and centre and he looked incredible. Does Channing Tatum look as good as Arnie? Or The Rock? Or even Stallone? No, but you know what? Women loved him in that movie, and it’s clear that his style seems to be a popular one. Remember that scene where Brad Pitt points out a picture of a shirtless male model and asks “Is this what a man looks like?”. Well Brad should have pointed at himself and asked the same question, because his physique was insane for that movie.